매일 공복에 1-3 온스 (30-90 ml)를 복용하세요. 개봉 전에 실온에서 보관할 수 있습니다. 병입구에 보호 씰이 훼손된 경우에는 사용하지 마십시오. 다른 물질이 첨가되지 않은 100% 순수한 노니 쥬스입니다. 최대의 효능 위해서 과일이 가장 잘 익었을 때 수확하여 특별히 가공한 제품입니다. 1서빙 당 30,000 mg 이상의 노니를 공급하며, 1병 당 960,000 mg 의 노니가 들어있습니다. 전통적으로 노니는 관절 건강, 면역 기능을 유지하고 & 일상 생활에서의 약간한 통증 & 아픔 등을 완화시키는데 이용되어 왔습니다! 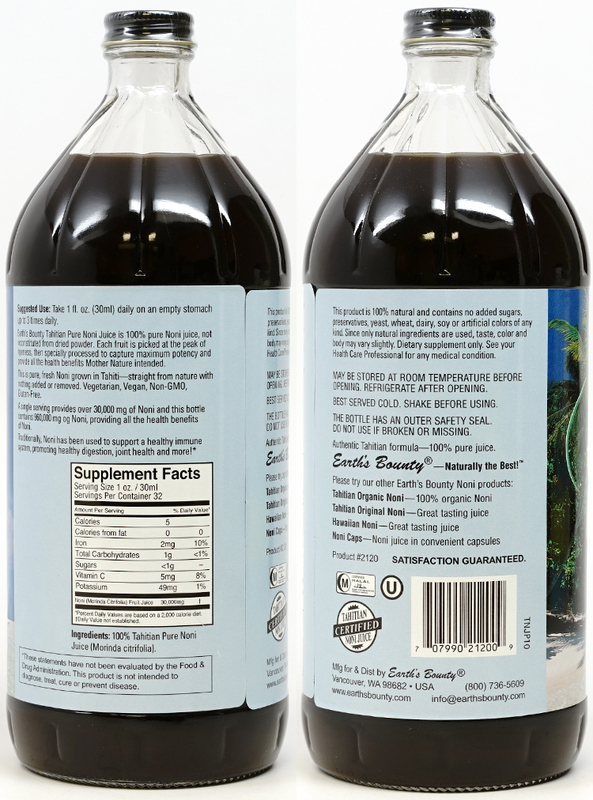 Earth's Bounty Tahitian Pure Noni Juice is 100% pure Noni juice, not reconstituted and nothing else. Each fruit is picked at the peak of ripeness, then specially processed to capture maximum potency and provide all the health benefits Mother Nature intended. This is pure, fresh Noni grown in Tahiti—straight from nature with nothing added or removed. Certified kosher & vegetarian. A single serving provides over 30,000 mg of Noni, & this bottle contains 960,000 mg of Noni, providing all the health benefits of Noni. Traditionally, Noni has been used to help maintain joint health, immune function & alleviate minor aches & pains from daily life and more! Authentic Tahitian formula—100% pure juice. The bottle has an outer safety seal. Do not use if broken or missing. Take 1-3 fl oz (30-90 ml) daily on an empty stomach. Other Ingredients : 100% Tahitian pure noni juice (morinda citrifolia). 다른 노니 제품 3~4 가지 먹어봤는데 얘가 제일 괜찮네요! 블랜드 제품이 아니라서 그런지 맛이 진합니다.